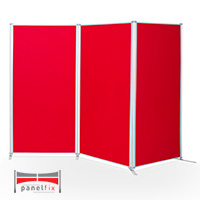 Panel & pole display boards are available in a range of different designs to suit your environment as well as your budget. 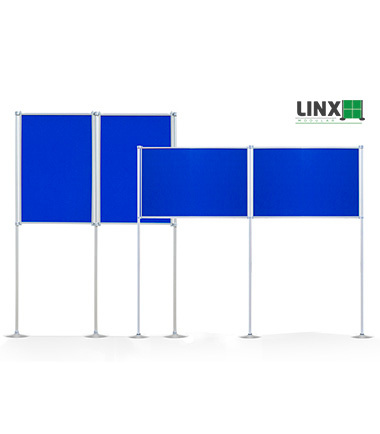 We design and manufacture the Linx, PanelFix and Universal panel & pole display boards and each has their own unique characteristics. 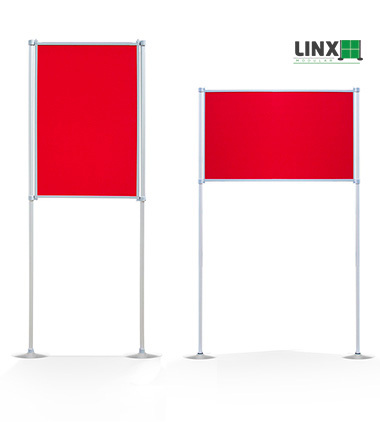 The Linx features the most lightweight design and serves excellently as a backdrop. 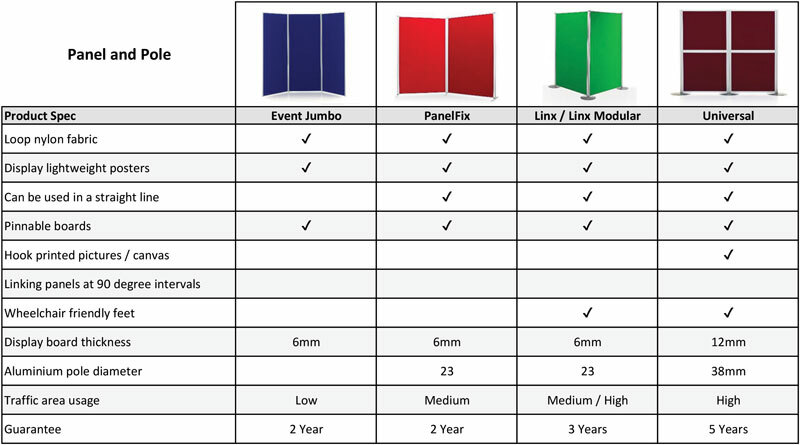 Meanwhile, the PanelFix display stands offer a sturdier solution, making it adept in areas with a moderate amount of footfall. 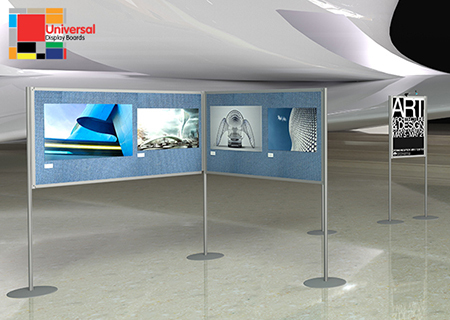 Finally, the Universal represents our deluxe solution, featuring strong panels and is ideal for use in busy areas. We equip all of the panel & pole display boards with an aluminium frame, poles and feet which make it extremely sturdy while also guaranteeing it is as lightweight as possible. 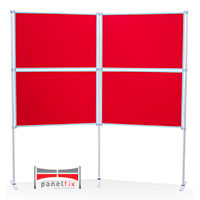 This sturdy design ensures the display boards are capable of exhibiting lightweight content. 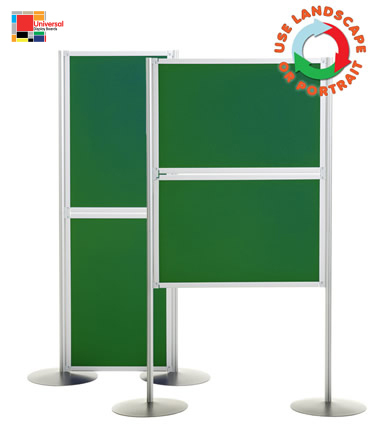 The Universal display boards feature stronger panels that are designed with exhibitions and trade shows in mind and the structure is there to ensure the display boards are safe and secure once set up. The panel & pole display boards are constructed using a lightweight core which is then compressed to create a strong panel. The next step is to add the loop nylon fabric which allows content to be applied using hook & loop dots as well as tape. To ensure the display boards remain as lightweight as possible while still retaining the strong structure, we include aluminium poles and feet. Setting up the panel & pole display boards could not be easier. We have created an intuitive design which ensures the panels simply slide onto the poles, which allows them to be set up in a matter of minutes. Another feature of the panel & pole display boards is that the panels are interchangeable, which essentially means they can be switched between a landscape and portrait orientation, depending on which content you wish to display. To help your display to stand out from the competition, there are a range of accessories available which can be used to enhance your display boards. This includes display spotlights to help illuminate content, printed posters to create a professional finish and even carry bags to help transport the panel & pole display boards when travelling to different events.